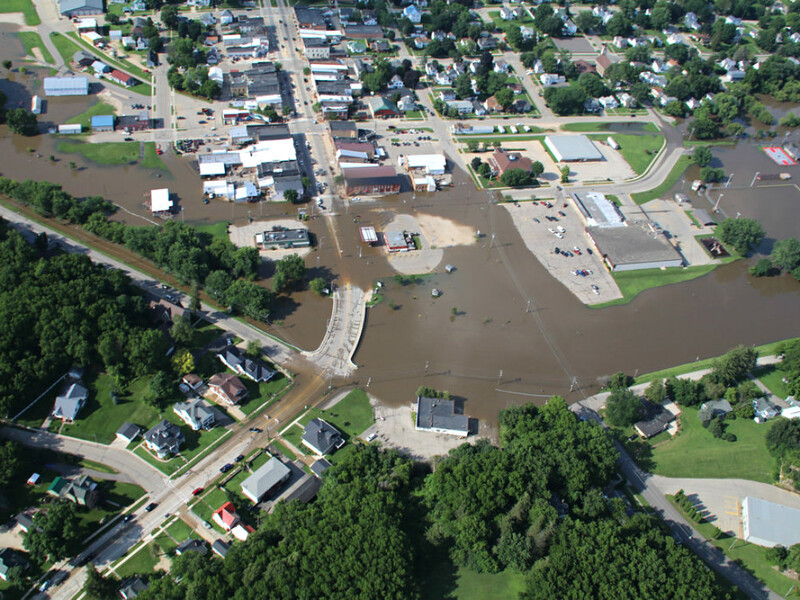 Flooding from the Chippewa and Eau Claire rivers struck western Wisconsin in September 2010. Concepts like the "100-year flood" can impact the flood insurance available to homeowners. The concept of flood recurrence intervals is a classic example of a communication gap that can form between scientists and the public. People who deal with floods professionally — from hydrologists to insurance actuaries to staff with the Army Corps of Engineers — use this concept to calculate the probability of certain levels of flooding happening in specific geographic areas. An engineer looking at a given area might calculate that a flood of a given magnitude has a one percent chance of happening there in any given year. That's often expressed in the shorthand of a "100-year flood," terminology that can confuse things easily. Members of the general public understandably wonder why it is that a so-called 100-year flood can happen twice in as many years, and so on. One study released in 2011 found that people living in flood-prone areas of Stockton, California did not understand their flood risks. And following a summer of heavy rains across Wisconsin and many other parts of the world, and especially in a year when hurricanes have caused extraordinary levels of flooding in places including Puerto Rico and southeast Texas, scientists are confronting that communications barrier, and even the limitations of the recurrence interval concept itself. "On the positive side, it's a number that a person can relate to," said Julie Kiang, a hydrologist with the United States Geological Survey. "On the downside, it tends to give this impression that oh, every 100 years it's going to happen but if it just happened there's no risk for me. ... I think it can be misleading in that sense. We've been trying to be more careful about how we talk about it." Flood recurrence intervals calculate the probability of floods by using data about what has happened in a given area in the past. But detailed information about rainfall and other factors that affect flooding only go back so far, and the availability of that data will vary from place to place. That means a hypothetical 100-year flood will often be the product of less than 100 years of actual data. In some parts of the U.S., precipitation data goes back to the late 1800s, but even that is unusual, said Eric Carson, a professor of geoscience at the University of Wisconsin-Madison and a geologist with the Wisconsin Geological and Natural History Survey. He points out, however, that geologists do have ways of finding out about rainfall in the past that don't rely on written records of rainfall, like analyzing deposits of sediment left by long-ago floods. 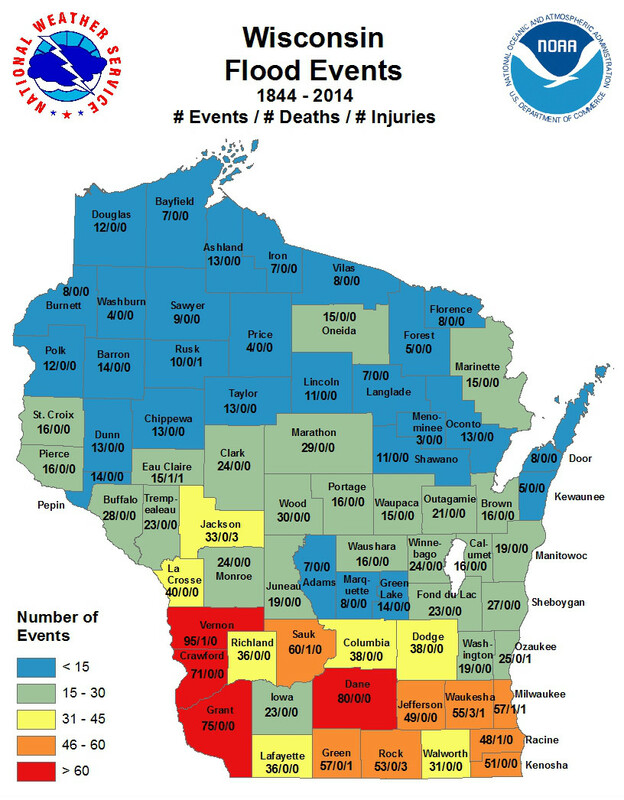 A map shows "flood events" in Wisconsin from 1844-2014 by county. Often flood projections are based on data that doesn't go back very far into the past. Probabilities are not meant to be predictions or absolute in nature. Recurrence intervals are used because organizations need some sort of mathematical baseline for making decisions where the possibility of flooding is relevant — what kind of buildings and infrastructure to build in what areas, what to charge for flood insurance on a specific property, or which areas to evacuate when a major storm is on the way. Preparing for floods is always a matter of chance and conjecture, but with recurrence intervals, there's at least some historical precedent informing the guesswork, and everyone is at least on the same page. The concept of recurrence intervals came to prominence in the U.S. during the late 1950s and 1960s, according to a collection of papers the USGS released in 2004 for attendees at a flooding conference. A Federal Emergency Management Official named Michael F. Robinson (who died in 2007) and a hydrologist named John R. Sheaffer (who died in 2016) contributed items addressing the history of the 100-year flood standard. "USGS was initially reluctant to provide information on the 100-year flood because it required extrapolating data beyond experience," Robinson wrote. He also noted that municipalities voiced some objections, because the standard would have required them to spend hundreds of millions of dollars to prepare their communities to meet requirements based on its outlook. Sheaffer pointed to the National Flood Insurance Act of 1968 as a key moment. Congress and the U.S. Department of Housing and Urban Development needed regulatory standards to enforce the act's provisions for flood insurance requirements and subsidies, so they brought together about 50 floodplain management experts to hash it out. "There were few flood records that recorded floods for a 100-year period at any gaging [sic] station," Sheaffer wrote. "Nevertheless, the discussions focused on the selection of a flood frequency determination that would delineate the regulatory area. The 100-year flood emerged as the flood to be used in the flood insurance program. There was no data on 100-year floods, but it was stated that it had 'a nice sound' to it and would give an allusion [sic] of safety." Climate change may present an even bigger challenge to the concept of flood recurrence intervals than any lack of data about the past rainfall. Climatologists project that the Upper Midwest, along with various other regions around the world, will become wetter as the global climate continues to warm, experiencing more rain overall and a greater frequency of extreme rainfall events. This pattern is forecast in part because a warmer atmosphere will hold more moisture. Given destructive floods across Wisconsin over the past decade — from the 2008 flooding centered on Baraboo to historic 2013 rains in the Driftless region to the July 2016 inundation of several counties in northwest Wisconsin — signs of this surge may already be appearing, though climatologists always caution against blaming any one weather event solely on climate change. 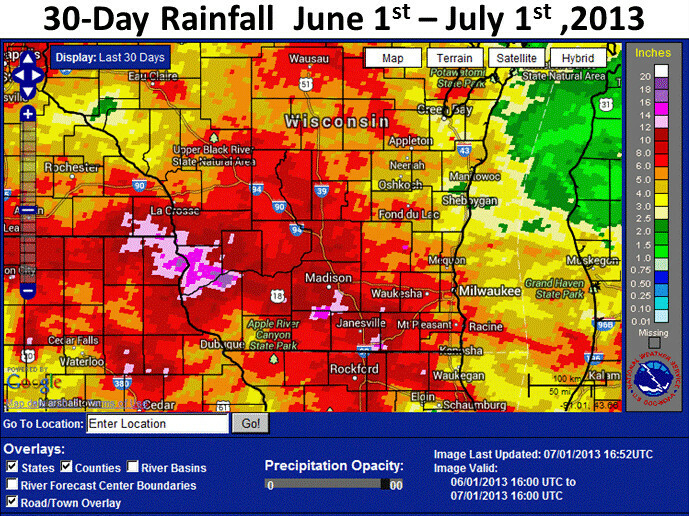 Wisconsin has a long history of floods, including those that struck the southwestern part of the state in 2013. Climate change may make rain more frequent and extreme. To incorporate potential future rainfall increases into flood recurrence interval standards, numerous actors across the scientific, business and government communities would have to sort out which projections to use and how to go about using them. While there is scientific consensus about climate change leading to increased regional rainfall in the future, different researchers' projections have very different things to say about how much it will increase, and how those impacts will vary from place to place. Additionally, it would be a major communication challenge to combine two concepts about which there are widespread misconceptions and suspicion among the public. "It would take pretty major change for every aspect of floodplain modeling and mapping, and the insurance industry, how we reimburse people with flood insurance, just looking at risk in general," said Stephen Veith, who studied how to incorporate rainfall projections into recurrence intervals in his 2015 master's thesis in urban planning at the University of Washington. "For instance, I believe that it would be really helpful for a lot of folks if instead of having discrete boundaries for a 100-year floodplain," he said, "we could instead show flood maps with a percentage of risk, and say well, on average in this zone there's a 1 out of 5 chance of flood." Veith, who now works in private industry, focused his research on one area in the Pacific Northwest — Snohomish County in Washington, just north of Seattle. His results, though, suggest that the current conception of flooding is due for a drastic rethink. "The median change of what we see as a 100 year event right now might happen every 30 years into the future, so that the intervals are getting closer and closer together as the climate changes," he said. The Pecatonica River in Darlington was one of several areas of Wisconsin that experienced flooding in July 2017. Every scientist interviewed for this story emphasized a need to combat misconceptions about flood recurrence intervals and communicate better with the public about what the concept means — including making clear that these calculations have a margin of error. Some said that changing how people apply the concept needs a dramatic shift as well. "The issue is developing a public awareness of the risk and instituting policies that are practice for the risk which isn't easily done, because a lot of the time we're looking at a landscape that is already populated and developed," said Eric Carson with the Wisconsin Geological and Natural History Survey. "You can't be evicting people off of areas that you decide are too flood-prone. It's not logistically easy and it's not palatable to the public." Carson said the best way to use the concept of 100-year flood intervals would be to discourage development or redevelopment in areas that are prone to this type of major flooding. "I think that's something we are very poor at," he said.